You all know I love soap making. I’d be the happiest person on Earth if I could do it all day! I’ve been watching videos, reading articles and blogs, and taking part in forums – and I’m finding out so much more about the hobby I love. 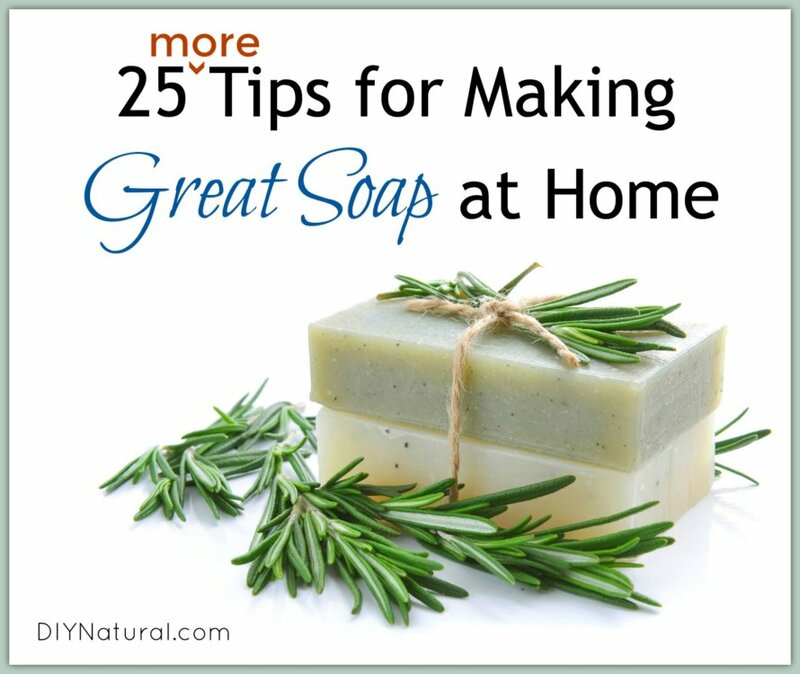 I first wrote about 25 Secrets for Making Amazing Soap at Home, then followed it up with 25 More Tips, and now I’m here to share even more tips with you! 2. Warmer pouring temperatures and gelling may cause “glycerin rivers.” These are clear to semi-clear lines that appear in your soap when cut. It’s just aesthetic and will not affect the performance of your soap. To avoid these lines, try pouring at a cooler temperature or not allowing your soap to gel. 3. What is gelling? Gelling occurs when soap heats up and becomes translucent in the center. Again, gelling does not affect performance, but using titanium dioxide may help prevent glycerin rivers. Some soap makers want their soap to gel, as they say it affects flexibility. You can force a gel in your molds by placing freshly poured soap in an oven that is about 170°F. Turn off the heat and leave it in overnight. It should have gelled and cooled on its own by morning. 4. Are you looking for ways to color homemade soap? Mica colors work well for melt-and-pour and cold process soap, but not the hot process method. Mica will mostly fade to a gray or brown when used in hot process soap making. 5. To color with mica, use a tea strainer as a mica dusting ball for even coverage. 7. DOS, or Dreaded Orange Spot, happens when there is too much fat in a recipe that is not used by the lye. Aim for about 5% excess through either of the methods mentioned above. Soaps with DOS will be discolored, greasy, and will eventually go rancid. Use bars up quickly if you end up with DOS! 8. When superfatting, add butters at the beginning with the oils. Be sure they are melted and liquid. If your liquid fat you are superfatting with is different from your base oils, add it at trace. Otherwise, it may be used up by the lye at the beginning. 9. Many recipes call for fresh ingredients. While I have been reluctant in the past, I’ve made a few batches with items such as pumpkin puree. These soaps will only last about six months, so use them up quickly! 10. Don’t allow your soap to gel if using fresh ingredients. Higher temperatures for sustained periods will usually cause rotting or mold. 13. When using palm oil, be sure to warm the entire bucket and stir well. The stearic acid in it will sink to the bottom, leaving less at the top of the bucket and more at the bottom. This could throw off your soap recipe. 14. Use a bit less water for faster curing. A water discount of 10% can shorten cure time by about a week. 19. If using vanilla-based oils, keep in mind they will turn soap brown. Use a vanilla stabilizer or choose a non-coloring vanilla oil. You can also work the vanilla into your soap colors. 20. To get the appearance of a half-and-half bar, use dividers in your molds. Gently lift the divider to allow the soap colors to meet with each other. 21. Use disposable piping bags to “frost” your soap “cupcakes.” Allow soap to get hard enough to hold a shape, then pipe onto the cupcake. Dust with colored mica to hide any imperfections. 22. Don’t be intimidated by intricate silicone molds. Pour in a single color, then paint with mica. (Add a small amount of water to mica and paint the colors onto the soap.) If selling or giving as gifts, be sure to tell people this color will come off during the first use. These fun decorative soaps are perfect for a guest bathroom. 23. Nut milks work just like dairy in your homemade soap. Almond milk, soy milk, cashew milk, or coconut milk can all be frozen and used in the same way goat’s milk or dairy milk is used in soap making. 24. Are you making a very large batch of soap? Use a method called “master batching,” in which large batches of oils and/or lye water are mixed up ahead of time and used as needed. When I make 100 bars of soap, I mix each batch of lye in a quart jar, then add a lid when it’s cool. I then mix enough of the oil for 3 batches and transfer it to jars. For each batch of 12 bars, I use one jar of room temperature lye, and 2 jars (marked A and B) of oil. I heat the oil to the point where both jars add up to 200°F (the lye is usually at about 75°F so I heat the oils to 125°F to balance it) and then I mix them. 25. When your work towels become so saturated by wax and oil that you can no longer clean them, try washing in hot water and drying. Then use them in the bottom of plant pots to close large holes so you don’t use so much dirt when planting. The natural elements on the towels will not harm the plants. Do you have any soap making tips to share? Let us know! are all your measurements in goats milk soap recipe scaled by weight? Actually, Eric, mine are not. I use a controversial method that I came up with many years ago. I took the weights and converted them to cups. You can see the original article in the website archives. As long as you don’t change the oils too much, stay within a short SAP range, and measure correctly, there will be no problems. The challenges with that are that you much be completely accurate in measuring and use the right ingredients, otherwise the weight could change, throwing off the recipe. And also be sure the lye is not old. This has been a problem in the past as well. Good luck! Do you have something for athletes foot? I’d try one of two things Jane. Either Tea Tree Oil or Rosemary Oil. Both are great antifungals and will help kill athletes foot. Oh let me know how they work out for you! I love playing with soap! If I can figure out how to post a picture, I’ll show you one of my HP swirly ones. This was a good article! I’m a soap maker also. I would like to add, though, micas can be used in hot process without fading or changing color, all you need to do is mix it with either a light oil or water before adding to the soap batter. It so much fun playing with colors! Another trick your readers may want to know, for a more fluid batter, you can add yogurt after the cook and let it sit covered for a minute or two before adding the fragrance or color. Also, saving your super fats for after the cook let’s you pick what you want. Again, thanks for a well written article! ? Thanks Robin, for all the suggestions! I will definitely try them. I’m working with the fluid hot process method right now. I’ll be making more soap later today, so I’ll give it a try. Yogurt? I’ve used goat’s milk, but not yogurt. I’ll have to try it! Thanks Nova Studio! Personally, I like the glycerin rivers, but I know a lot of soap makers who don’t. I’ll have to try that next time. You’re so right, Grace! Caught me! Glad you enjoyed the article otherwise.